Recently, I had started going to the gym again, this time at True Fitness. 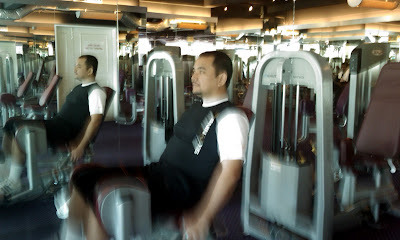 Ever since I had some back problem in March 2009, I had not really exercise that involves weights. I am allowed to bring another person, so I brought CaTz along. We had 2 sessions with the personal trainers, whom brought us up to speed on what and how to operate the various machines. After the first round, I felt more at home.